Here I am putting together the pieces I want for my copper collage. I notice that the clay gets dry pretty quickly, making it harder for me to manipulate without it breaking or getting little cracks. I tried to smooth the clay out with water, but it was never completely smooth. It had these mini cracks that seemed like nothing, like they could be sanded once the clay dried. Here I had to make some paste to stick things together, so I used a little bit of clay and mushed it up with Sherri Haab’s paste maker, which I use for silver clay. Now I think that the copper paste would have probably been better with just distilled water and lavender oil instead, because it gets so dry so quickly. I tried to reinforce the spots I considered weaker on the back of the piece, and once it was dry I sanded and reinforced the edges. After I finished adding all the parts and making sure it was completely dry, I fired the piece on the SpeeFire Cone at 1400 degrees for 30-40 minutes. Notice the very red color, which is different than the salmon color you get when firing silver clay. As the piece was being fired, it bent a little bit, probably because the strips were of different thickness and not flat against a surface. Still, I thought the bent shape actually looked good! 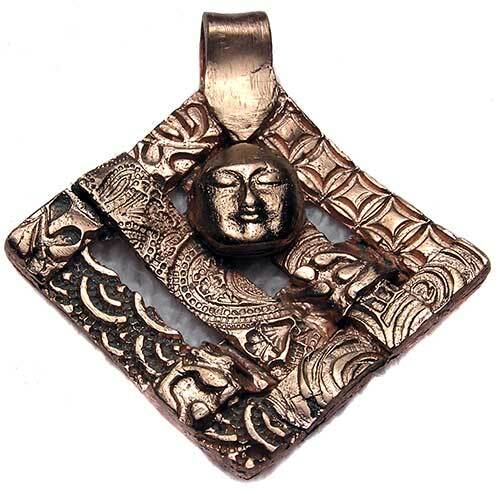 As the pendant was fired, it became darker and darker, as it was oxidized. When I quenched it in cold water, most of the oxidation fell off right in the bowl. I was so excited! I placed it in a pickle solution to completely remove the oxidized layer and left it in it for over an hour. Here is the somewhat finished piece, after being pickled and polished a little bit. You can probably see the small cracks here and there, especially the one on the bottom. I was disappointed to see these cracks and tried to file them, but a couple were deep enough to make the piece unsellable. The left section didn’t lose the oxidation after being pickled, so I put the pendant in the pickle solution again for another hour, Still, the oxidation didn’t go away and I am not sure why. In any case, this was an experiment, so after closer observation of the piece I noticed that it was weak and showed cracks in certain spots where I had used the paste, and in other spots where the clay was probably too thin, or maybe was bent while putting the pieces together. This would probably not have happened had the pendant been a single flat piece and not several strips of textured clay.